Deep in the jungle of Bangalla lives a masked comic-strip marvel known as the Phantom, a guardian of the innocent who fights against the destruction of injustice. His powerful feats, which stretch over four hundred years, earned him the alias of the ‘Ghost Who Walks’ and the ‘Man who Never Dies’. Despite his perceived immortality, the Phantom is a legacy hero, part of a genealogy of crime fighters who have all undertaken the ‘Oath of the Skull’ and donned the iconic black mask and purple skin-tight suit. 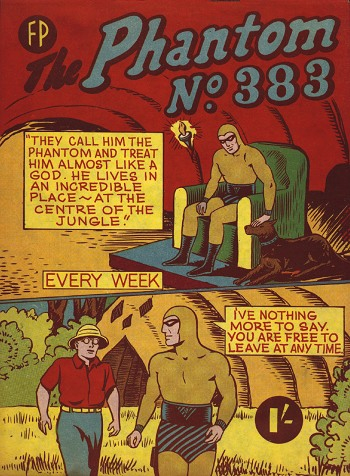 The Phantom Issue 311 published in Australia by Frew Publications, the world’s longest running publisher of The Phantom comic. 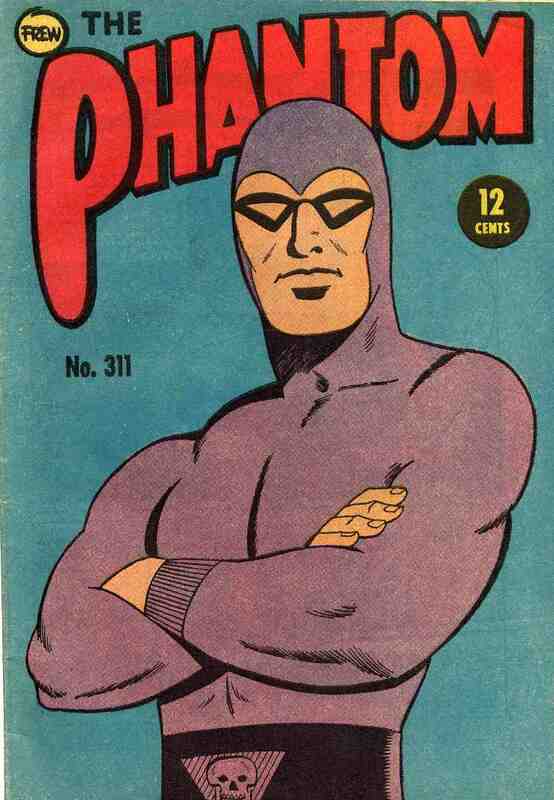 The Phantom was created by American Lee Falk in 1936 and was the very first costumed superhero preceding Superman by two years. The Phantom comic strip debuted in The New York Journal on February 17, 1936. Since then The Phantom has been published in more than 500 newspapers in approximately 40 countries, creating legions of dedicated ‘phans’. The comic has been translated into approximately 15 languages including Tok Pisin, a form of Pidgin English which is recognised as one of three national languages of Papua New Guinea. In Papua New Guinea, The Phantom comic strip was translated into Tok Pisin by the weekly publication Wantok – literally ‘one talk’ a reference to people who speak the same language. Wantok was founded in 1969 by the late Father Francis Mihalic of the Societas Verbo Divini, more commonly known as the Society of the Divine Word. The newspaper aimed to target everyday ‘grassroots’ people and inform them on an array of issues including agriculture education and politics. Stories and photographs were often sourced from government departments, churches and sporting groups, offering a window into what was happening in other parts of the country. 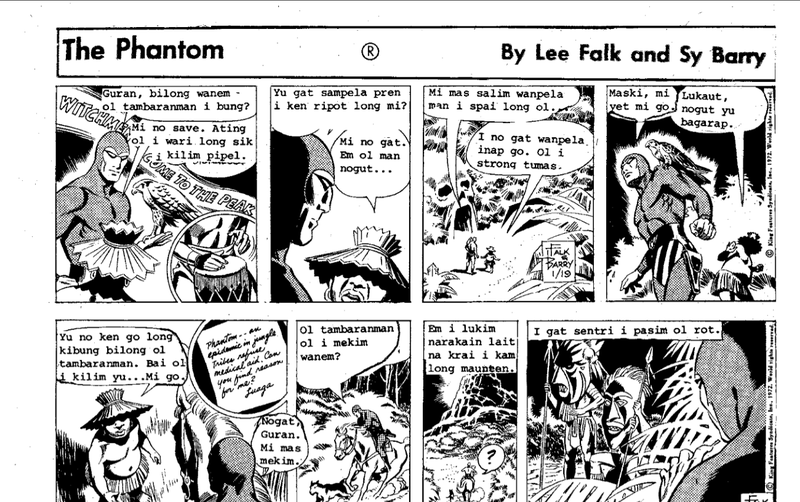 In 1972, Wantok began to publish The Phantom comic strip translated into Tok Pisin. Due to translations issues, the Tok Pisin version of the comic strip was published later than the English version which appeared in the national paper Post Courier. Regardless of the delay, thousands of readers rushed out very week to buy a copy of Wantok to read about the Phantom’s latest adventure. The translations localised the international superhero for an indigenous audience and helped to spread a common Tok Pisin vocabularly. If you eat more peanuts you will be strong like the Phantom. In 1977, Wantok was forced to stop publishing the Tok Pisin version of The Phantom due to a dispute with Post Courier. From the 1980s – 1990s the Phantom re-emerged on battle shields during a renewed period of inter-tribal fighting in parts of the Papua New Guinea highlands. For a brief period, the Wahgi people of the Western Highlands Province revived and re-painted old battle shields with new designs that transformed the shields into communicative forms. This expanded design repertoire included numbers, text, appropriated logos as well as representations of ‘good guys’ such as Superman and the Phantom. By incorporating the image of the Phantom on a shield, warriors hoped to capture some his symbolic power and incite fear amongst their opponents. Some shield designs also incorporated text such as, ‘man i no save dai’ which translates approximately as ‘a man who can’t be killed’ in an attempt to harness his immortality. Recently Te Papa acquired two examples of shields decorated with the Phantom character however they have depicted him wearing different coloured suits. The colour discrepancy could be a reflection of the creative license of international comic book publishers who often took liberty with the colour of his costume. In the first Australian Phantom comic book produced by the Australian Woman’s Mirror the Phantom appeared in a vibrant green suit. Here in New Zealand in The Phantom comic book produced by Feature Productions in Lower Hutt he was depicted wearing a light brown suit with blue and black striped trunks. Interestingly, the original colour of his costume was grey and he only acquired his trademark purple uniform in 1939. Although the production of Phantom shields appear to have declined by the 1990s, they mark a unique moment of pop culture revival that helped to further anchor the Phantom in the Pacific, as a superhero of Papua New Guinea. Cochrane, S. (2013) 2. ‘Inter-animation of Kastom and Contemporary Culture: Papua New Guinean Art at the Asia Pacific Triennial’. Contact issue, Australia and New Zealand Journal of Art, p. 147-169. ‘Fantom, Yu Pren Tru Bilong Mi’ A Comic Strip Becomes a Hot Issue in the Jungle’ in Time, September 26, 1977. O’Hanlon, M. (1995), Modernity and the ‘Graphicicaliszation’ of Meaning: New Guinea Highland Shield Design in Historical Perspective. In The Journal of the Royal Anthropological Institute, Vol 1. No. 3, p. 469-493. Pacific Islands Community Newsletter, Vol 7, No. 4, December 1977. Enjoyed your article, Nina. Thanks. The Phantom was a favourite among us kids in Fiji in the 1950s, mostly in black and white comic books via Australia but occasionally we would get a colour one from the States. By that time Superman and Captain Marvel had joined the genre well and truly, and we used to swap them back and forth. As you probably are aware, before he came up with the Phantom Lee Falk created Mandrake the Magician, which began publication on June 11, 1934 and is still going strong in newspapers in Aus. Thanks for reading the blog and taking time to leave a comment. Interesting that the Phantom was as favourite in Fiji as I have just learned that he was also popular in the Cook Islands as well. Great story Nina. Yes, I always thought The Phantom wore a brown suit. I had no idea that this was just the New Zealand version. Hi Giles, thanks for reading the blog and sharing your memories of seeing Phantom shields in Papua New Guinea.